Elanco's new Vaccines Innovation Center will enable scientists to address some of animal health's most pressing issues. Elanco Animal Health, a division of Eli Lilly & Co., has announced the opening of a state-of-the-art Vaccines Innovation Center whose intentional design will enable scientists to address some of animal health's most pressing issues. Half of the 48,000 sq. ft. space comprises an open-concept collaboration environment intentionally designed to encourage scientific interaction. The remaining floor area houses an integrated laboratory space equipped with the very latest technology in the fields of immunology, molecular biology and microbiology. 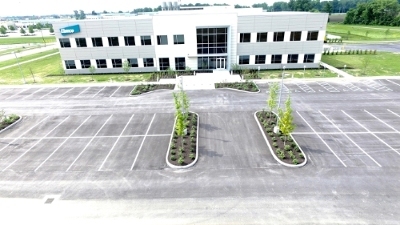 The Vaccines Innovation Center is the global centerpiece of the Elanco vaccines R&D model and one of its unique features is a self-contained master seed suite. Master seeds are the critical starting materials for any vaccine and must be prepared with great stringency. The Vaccines Innovation Center's specialized suite comprises three distinct, access restricted zones with dedicated air handling and single pass personnel flow to optimize biosecurity. Seeds laid down in this suite will provide the critical starting materials for production of vaccines throughout Elanco's global manufacturing network. "From foundation to roof, this new building creates an environment for innovation," said Aaron Schacht, vice president of Elanco Research & Development. "Our scientists will use leading approaches to develop vaccine products that address key needs for the health of animals, including innovative alternatives to antibiotics." Elanco scientists working within the labs will tackle several important fields of research, one of which is finding alternatives to antibiotics used in food animals. Two near-term projects involve exploring vaccines for salmonella — which is estimated to cause 1 million foodborne illnesses in the U.S. and roughly 82,000 in the EU annually — and bovine respiratory disease, which affects three out of every four cattle. Work being conducted in the Vaccines Innovation Center is a tangible result of Elanco's eight–point antibiotic stewardship plan, which was rolled out last June. The multifaceted plan is an aggressive means to safeguard antibiotics for future generations while protecting animal well-being. "The Vaccines Innovation Center underscores our commitment to invest in innovation, bringing new antibiotic alternatives to market," said Jeff Simmons, president, Elanco Animal Health. "We've pledged at least two-thirds of our food animal research budget to development projects that address diseases where there are few, or no, alternatives to shared-class antibiotics. We are truly going where the unmet need is, where our customers and the animals they care for need the most help." Beyond antibiotic alternatives, the center will also house research into several companion animal vaccines, including the exploration of more "patient friendly" delivery technologies, which could make annual vaccinations easier for both the pets and the veterinarians who care for them. Elanco provides comprehensive products and knowledge services to improve animal health and food-animal production in more than 70 countries around the world.